Fruit fly can cause devastating damage to fruit and vegetable crops. Throughout the world there’s a pest so troublesome that its name can send shivers through the hardiest of farmers: the fruit fly. The fruit fly’s pesky offspring is responsible for the pest’s place as the world’s number one biosecurity barrier to trade. The fruit fly lays its eggs in the flesh of fruits and vegetables as they ripen. As the larvae hatch, they eat the flesh, which ripens prematurely and rots – rendering entire crops unsellable. It’s the mushy stuff of nightmares, and for producers it can be an actual nightmare, costing more than $300 million every year in Australia alone. Monitoring the spread of fruit fly currently relies on manually checking traps every one to two weeks. But a new Australian tech startup, founded by our former researchers, is set to change everything. 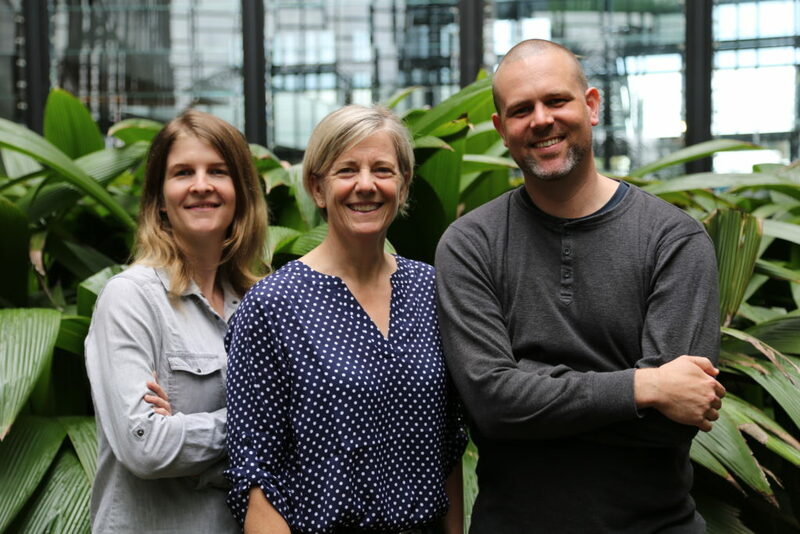 Our former researchers Laura Jones, Nancy Schellhorn and Darren Moore founded RapidAIM to take their solution to the world. Credit: RapidAIM. Growers use and rely on real-time weather radar to make decisions, but until now they haven’t had any pest “radar” to support them against pests like fruit fly. That’s where RapidAIM system comes in. It uses low-powered smart sensors to detect insects like fruit fly from their characteristic movements – similar to a fingerprint ID. The sensors, which can be placed by the thousands, send data to the cloud using a radio modulated technique, giving producers real-time data flow of the pest on their farms and regions through a linked mobile app. With an immediate picture of fruit fly presence in specific locations, we can react rapidly to control the pest, and reduce the time spent checking fruit fly traps by more than 35 per cent. And fruit fly is only RapidAIM’s initial target – it has the potential for managing food and fibre pests around the world. RapidAIM was developed by our former researchers Dr Nancy Schellhorn, Darren Moore and Laura Jones, who saw an opportunity to create a solution to help in the fight against fruit fly. Together they developed what would become the RapidAIM system over the years, successfully trialing it with some of Australia’s biggest fruit producers in Victoria last year and showing it had huge potential to make a difference for growers around the world. And when it came down to it, they were all so passionate about their creation that they couldn’t bear to part with it. With support from our innovation program ON, and a $1.25 million investment from Main Sequence Ventures via our Innovation Fund, the trio founded the new RapidAIM company to make their vision a reality and take their hard work to the world. Feeling the buzz about fruit fly monitoring? CSIRO may be a perfect career path for budding entrepreneurs. We assume that the trio, when they left for their “start up”, took only their personally attained skills, and not some “leg up”. Or does CSIRO receive some kick back from the invention?.